Buffalo Rabbit Nachos combines two classic appetizers into one awesome recipe. What’s better than wings and nachos? Well rabbit nachos with a Buffalo twist! 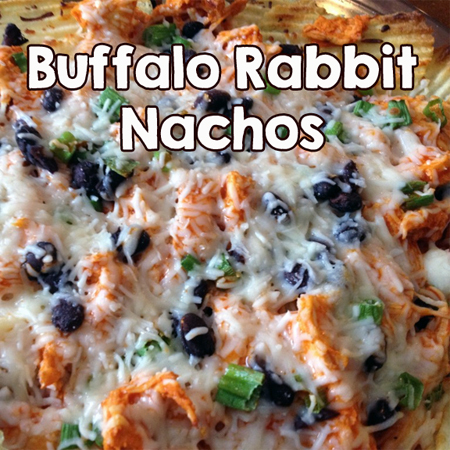 Buffalo Rabbit Nachos is an easy appetizer that can be assembled and baked in 10 min. In a mixing bowl add the shredded rabbit and the buffalo sauce. Stir until the rabbit is completely covered. Line a pie plate with your favorite kettle chips. I suggest using large kettle chips. Then evenly distribute the rabbit mixture over the chips. Sprinkle the black bean and mozzarella on top. If you prefer your buffalo rabbit a little spicier, you may drizzle additional buffalo sauce on top of the nachos. Place the nachos under the broiler until the cheese has melted. Keep a close eye on it…. it will only take a few minutes. Serve warm.